Farnham and Burlington: Ashgate 2011. xix+335pp. Kierkegaard has long been known as a philosopher and theologian, but his contributions to psychology, anthropology and sociology have also made an important impact on these fields. In many of the works of his complex authorship, Kierkegaard presents his intriguing and unique vision of the nature and mental life of human beings individually and collectively. 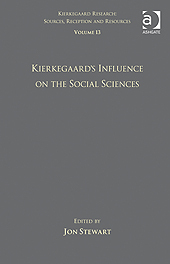 The articles featured in the present volume explore the reception of Kierkegaard’s thought in the social sciences. Of these fields Kierkegaard is perhaps best known in psychology, where The Concept of Anxiety and The Sickness unto Death have been the two most influential texts. With regard to the field of sociology, social criticism, or social theory, Kierkegaard’s Literary Review of Two Ages has also been regarded as offering valuable insights about some important dynamics of modern society.